NETWORK FINALS: Game 3 of the NBA FINALS adjusted to 6.4. 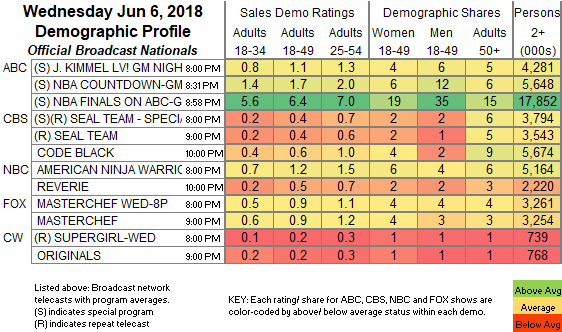 In addition, AMERICAN NINJA WARRIOR gained 0.1 in final numbers. CABLE HIGHLIGHTS: Two networks tied for Wednesday cable bragging rights in the 18-49 demo. Bravo’s REAL HOUSEWIVES OF NYC dipped 0.03 to 0.49. VH1’s BLACK INK CREW was also at 0.49, down 0.09 from last week. On HGTV, BROTHER VS BROTHER rose 0.07 to 0.37, HOUSE HUNTERS dropped 0.06 to 0.27, and HOUSE HUNTERS INTL was down 0.09 to 0.24. The post-controversy episode of TBS’s FULL FRONTAL gained 0.04 to 0.31. The CMT MUSIC AWARDS was at 0.28 on its home network, and was also simulcast at 0.12 on Paramount, and 0.08 on TV Land. Food Network’s GUY’S GROCERY GAMES lost 0.04 to 0.28. Fox News’s TUCKER CARLSON TONIGHT led cable news at 0.27/0.46/2.7M, with MSNBC’s RACHEL MADDOW SHOW at 0.24/0.38/2.5M, and CNN’s CUOMO PRIME TIME at 0.22/0.31/1.2M. The series finale of Freeform’s THE FOSTERS was at 0.27. Nickelodeon’s afternoon LOUD HOSUE remained in the Top 18 at 0.24. OWN’s QUEEN SUGAR fell 0.07 to 0.22. On ID, MURDER CHOSE ME slumped by 0.11 to 0.21. USA’s COLONY ticked up to 0.21. Lifetime’s LITTLE WOMEN: LA ticked down to 0.20. On TLC, MY 600-LB LIFE shed a tenth to 0.20, and SKIN TIGHT was down 0.03 to 0.17. 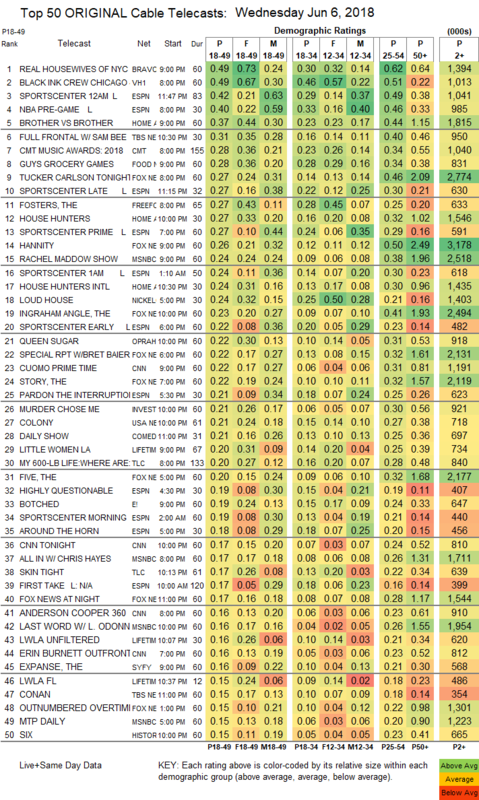 E!’s BOTCHED fell 0.06 to 0.19. Syfy’s THE EXPANSE lost 0.04 to 0.16. On History, SIX dropped 0.05 to 0.15. FXX’s ARCHER was down 0.03 to 0.14. Discovery’s STICKER SHOCK shed 0.06 to 0.12. POP’s HOLLYWOOD DARLINGS ticked down to 0.03/114K. Sundance’s THE SPLIT was at a dead zero/71K, down its remaining hundredth in the demo, and we will no longer be covering it here.